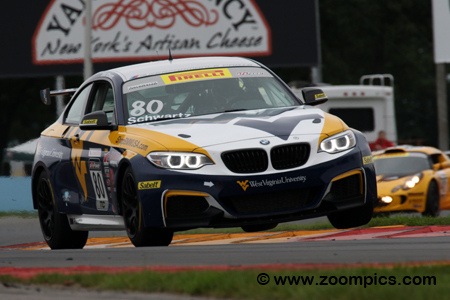 For the first time since 2010, the Pirelli World Challenge series made a stop at Watkins Glen International in an event called the PWC Grand Prix of Watkins Glen presented by TM Performance. Touring Car teams would compete in two forty-minute races around the eleven-turn 3.4-mile road course to determine the 2018 class champion. The start of Saturday’s race and twenty-one entries funnel into Watkins Glen International’s first turn. 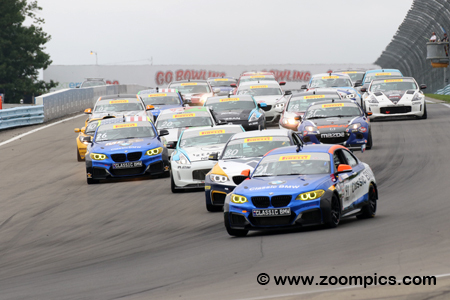 Beating the field to corner one is the pole-sitter, Karl Wittmer in the Classic BMW sponsored BMW M235iR Cup. Falling in behind Wittmer is another BMW M235iR Cup driven by the other front starter, Johan Schwartz. 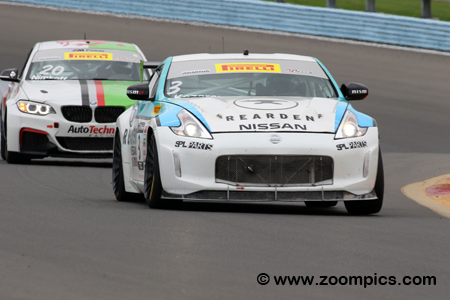 Behind the two BMWs in the Nissan 370Z TC Spec of the point’s leader, Vesko Kozarov. 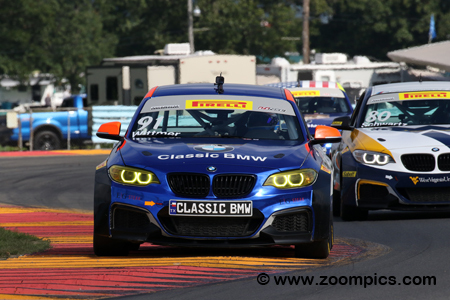 Karl Wittmer entered Watkins Glen second in the standings and was ‘pulling out all the stops’ in an effort to close the gap on Vesko Kozarov. In qualifying for the penultimate round, he won the pole. During the race, Wittmer lost the lead to Johan Schwartz but regained first place on the last lap for his second win of the season. On Sunday, he started first but lost the position to Schwartz and took the runner-up spot. 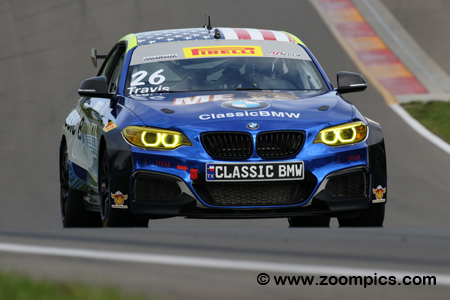 Johan Schwartz, the 2015 Pirelli World Challenge TCB champion returned to the series fulltime driving the Rooster Hall Racing BMW M235iR. His season included two wins. 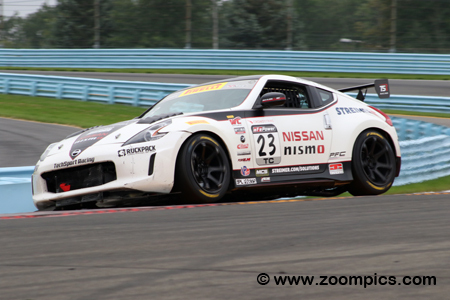 At Watkins Glen, Schwartz dominated the practice sessions and was second quickest in qualifying. In race one, he took the lead from Karl Wittmer but lost it on the last lap. The following day, Schwartz redeemed himself by capturing the victory. 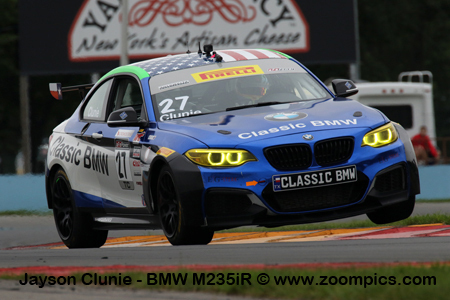 Classic BMW entered three BMW M235iR Cups at Watkins Glen International the No. 26 BMW was driven by Matt Travis. Travis was fourth in the title chase and with a solid performance could improve is position in the final standings. In the weekend’s first race, he was gridded fifth. Travis drove a great race and earned the final spot on the podium. The following day, he had the same outcome - a third place finish. Heading into Watkins Glen, Vesko Kozarov had six victories in ten starts and an almost insurmountable points lead in the title chase. In the practice sessions, Kozarov was only ninth quickest but in qualifying, he improved and was fourth fastest. In round eleven, Kozarov maintained his starting position to the finish. On Sunday, he could do no better than sixth but it was enough to take the championship by a slim four-points. TechSport Racing’s, Steve Streimer had a big weekend earlier in the season at Virginia International Raceway where he grabbed a win and runner-up finish. Since then his results had been mixed. In qualifying for round eleven, Streimer was twelfth quickest but was unable to improve on his starting position in the race. In the season finale, he completed only two-laps before retiring. 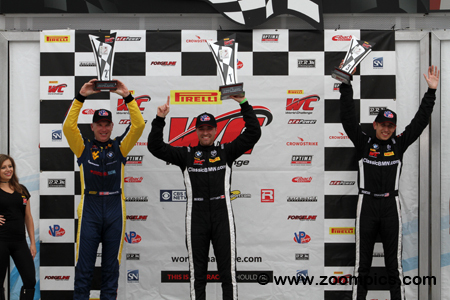 The Pirelli World Challenge Touring Car class podium for round eleven at Watkins Glen International. To the left is the runner-up, from Rooster Hall Racing, Johan Schwartz. And, on the right capturing his fourth podium finish of the season is the third-place finisher, Matt Travis. In the center, is the winner Karl Wittmer. The victory put Wittmer to within twelve-points of the series leader, Vesko Kozarov.